This month is Thyroid Awareness Month and besides the fact that drawing awareness to a disease that effects well over 30 million Americans, it is also very important to bring more attention to this subject for the fact that thyroid disease is more often than not, untested for, misdiagnosed or even overlooked all together. The campaign to help bring awareness to this disease was brought about to not only bring attention to the matter, but to also help those who have been diagnosed and to make sure others who may not be, to get themselves tested and help them find out how to treat it. Thyroid disease is most often caused by autoimmune disease and can affect men, women and children (however, women are 7 times as likely to be diagnosed with the disorder). Thyroid disease is typically broken down into two categories (when diagnosed properly), one being Hypothyroidism (also know as underactive thyroid) and the other being Hyperthyroidism (also known as overactive thyroid). However, Thyroid disease can also be thyroid cancer, thyroid adenoma and even on rare occasions can be lymphomas or metastasis. This disease can be an actual cause of weight gain and difficulty losing weight (or even to the other extreme of weight loss), high cholesterol, depression and loss of hair, and can be the reasons for infertility, miscarriage, breast feeding problems and other menstrual issues for women. So during this month, whether you are showing support for a friend, a family member or helping your own cause by bringing awareness, you can wear these light blue ribbon products with pride. 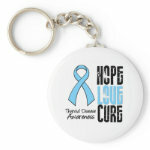 Help bring awareness by wearing the light blue ribbon on a button, t-shirt, sticker, hoodie or by carrying a key chain, drinking from a mug or through many of the other products.